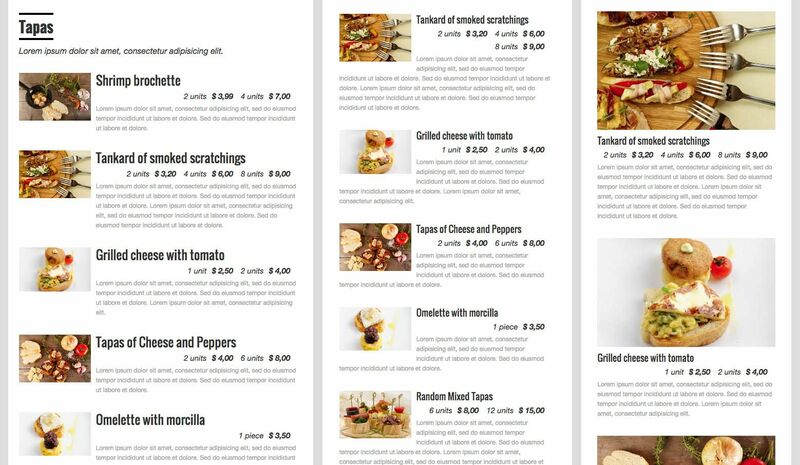 Quick Restaurant Menu plugin allows you to create quickly menus for eateries, cafes, bars and restaurants. You can include images, descriptions, sizes and images. Display different menus for each day of the week and also for different hours in the same day. Suppose for example you want to display a menu for lunch and another one for diner, then depending on the hour the visitor access your website it will show a different menu. The plugin uses default WordPress functionality. Creates two new post types, Menus and Menu Items, which are used to construct the menu. You can create and edit menu items inside the menu post interface, rearrange them with drag and drop, and group them into sections. Then use a shortcode to display it in posts and pages. Create your own food tags and manage a complete set of nutrient facts for each meanu item. Display all features in a popup window. Display different menus based on specific day/time of the week. You can show for instance a daily menu and a weekend menu in the same page. Use WordPress customizer to quickly change the style of your menu: colors, font-family, font-size, margins, alignment, etc. Display a full-width picture when user clicks the thumbnail of the menu item. Let your customers share your menu items in Facebook, Twitter, Googl-plus, Linkedin ans Pinterest.